The shortlist included the likes of Delhi Haat, Center for Social Research, Yamuna Biodiversity Park, Katha and Khoj. GOONJ is an NGO formed in 1999, working on issues of urban waste and social distribution. Chintan, a material recovery facility at New Delhi Railway Station, and GOONJ, an NGO working in the area of urban waste, have jointly won the seventh Deutsche Bank Urban Age Award 2014 in Delhi, which entails a cash prize of $1,00,000. The winners were chosen by an independent jury from 135 entries, eventually coming down to a shortlist of nine finalists. The shortlist included the likes of Delhi Haat, Center for Social Research, Yamuna Biodiversity Park, Katha and Khoj. presented the prize to the winners at a ceremony in Delhi last week, wherein the keynote address was delivered by boxing champion Mary Kom. The jury said it chose the two projects in order to “emphasise the importance of more sustainable cycles of consumption and production, and for thinking creatively about locating workplaces and employment opportunities in cities”. Anthony Williams, jury member and former Mayor of Washington DC, said, “I’ve been on all the juries now, and of all the cities we’ve visited and all the projects we’ve reviewed, we’ve seen the best set here in Delhi.” He added that such initiatives could be a wonderful arm of diplomacy for the country. The Chintan MRF project at the New Delhi Railway station manages tonnes of unsorted garbage from the numerous trains that arrive at the railway station every day. 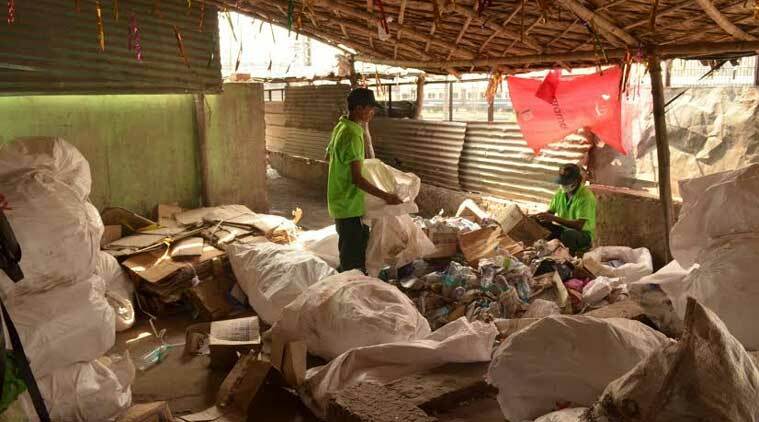 The garbage, which would otherwise end up in landfill dumps outside the city, is sorted into organic and non-organic waste by trained workers at the centre. Once sorted, waste is passed onto various corporate producers like Tetrapack for recycling. Proper management and a systematic process has also lead to more dignified livelihoods for the otherwise marginalised ragpicker’s community. The profits are used to improve social awareness among them and to create educational facilities for their children. The facility stands on a former garbage dump, which has been transformed into a dignified and clean working space where the trained rag-pickers come and carry out their livelihoods. On the other hand, GOONJ is an NGO formed in 1999, working on issues of urban waste and social distribution. Its mission is to re-use vast quantities of untapped old and waste material in middle class households to create second-hand products. The material left at GOONJ drop-in centres is sorted at a facility run by the group at Madanpur-Khadarpur village. Embedding the facility in the community ensures local employment opportunities for women in the area. The sorted material is then used as a parallel currency for development programmes in rural areas. This supports hundreds of grassroots programmes like digging wells, improving sanitation, and making bamboo bridges. GOONJ deals with about 1,000 tonnes of solid waste annually and ensures nothing ends up in landfill sites. Some products are also sold through various channels to generate funds that help sustain the organisation. Any remaining pieces of cloth are turned into sanitary pads for rural women. The award is associated with the Urban Age project, a worldwide investigation into the future of cities jointly initiated by Deutsche Bank’s Alfred Herrhausen Society, and LSE Cities at the London School of Economics and Political Science. The initiative is an international investigation of the social dynamics of cities centred on an annual conference. Since 2005, over 12 conferences have been held in rapidly urbanising regions in Africa and Asia, as well as in mature urban regions in the Americas and Europe.